Rich in omega-3 fat, sardine is one of the best choices for making a nutritious and healthy recipe. The following recipe can be prepared on a short notice with limited ingredients. You can serve these fillets either with rice or with bread. As always, you can moderate the spice index as per your preference. If you do not like a sardine, substitute it with a trout. Do not bake or deep fry these fillets to make sure the authentic flavor remains intact. You can also drizzle your favorite curry or sauce on top of these fillets right before serving. The leftovers of these fillets can be shredded and can be added to a noodle preparation. 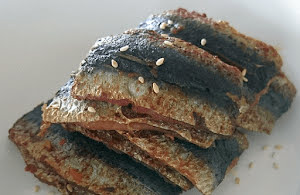 Let's quickly make these scrumptious, spicy, and fulfilling sardine fillets for our loved ones. Savor these flavorful, hot, and mouthwatering sardine fillets which are drenched in a spicy coat of spices and are delicately shallow fried to perfection. Rub salt on all the fillets and keep aside for 5 minutes. Meanwhile, mix red chili paste, garlic cloves paste, apple vinegar, light soy sauce, sesame oil, onion powder, and white pepper powder in a large bowl. Add salted fillets in the bowl and coat the spicy marinade on the sardine fillets with your hands. Keep aside for another 5 minutes. Heat 3 tsp vegetable oil in a nonstick frying pan. Place all the fillets in the pan with skin side up in two batches. Fry for about 4 to 5 minutes.